Many of you have been asking—begging, even. I can’t let your questions go unanswered a minute longer. Really, you’ve been so patient and I do appreciate it. The time has come to post about something very near and dear to my heart. It’s time to talk about my new favorite Mexican restaurant. They have great food and even greater margaritas, and the best ceviche I’ve had outside of Cancun. The tables and chairs are carved and hand-painted, the décor bright with festive sombreros and vibrant pictures. But this is more than a restaurant. Our family stumbled upon Puerto Vallerta one Sunday night in November. We’d spent the chilly gray afternoon kind of aimlessly wandering around the house bickering, and we decided we needed to go out for dinner to change our mood. The restaurant is in a slightly run-down strip mall that also boasts a gym, a nail salon, and a wine bar. I’d noticed it the last time I had my nails done. We were the only people eating that night. We sat at a long table in the center of the room, and as our waiter, Carlos, brought us basket after basket of chips, we started to talk. Not yet thirty, he told us how he moved here from Mexico this winter to start the restaurant with his older brother, how in his homeland he is a dentist. But here, his degree is meaningless. In halting English, Carlos talked about their hopes for success, the slow start to the business. Joe and I have an appreciation for those who try to make a go of it in a country that is not originally theirs, mostly because of my mother-in-law, Adua. Adua grew up in the rural countryside of Italy. The war started when she was four years old, and in the dark of the night, her family hid their best possessions and fled the German army, taking refuge in a cave-like shelter in the woods while the soldiers occupied their house. Some months later her family returned home, and they began the process of cleaning, restoring, reclaiming. Adua’s six-year old sister, Nicolina, stumbled upon a hand grenade left behind by the troops, and it exploded in her hands. Adua watched as her mother kept vigil by her older sister—bandaged and silent in her bed—until she passed less than a week later. Ravaged by war, her family endured more tragedy later that year; twin boys, Luigi and Paolo, born two months too soon and buried weeks later, side by side in tiny white coffins. When she was sixteen, Adua made the long boat trip across the sea to America with her father and younger brother, leaving her mother and four sisters behind. Once in New York, she was judged too slow for a regular classroom because her grasp of English was shaky. She dropped out, and kept house for her father and brother, eventually marrying and having six children of her own. These days, Adua is a doting grandmother to twenty. She rarely speaks of the war, the explosion of a hand grenade, or her twin baby brothers, and her quick laugh belies the heartbreak of her past. We went back to Puerto Vallarta for lunch last week. When we walked in, a slight boy around six years old was standing with his father at the hostess desk, wiping and stacking menus. Together, father and son—owner and honorary employee—chatted animatedly in Spanish, their bright laughter punctuating the otherwise quiet dining room. The little boy, Jorge, was dressed head to toe in a traditional server uniform—button-down shirt, dress pants, long black apron. Solemnly he brought our basket of chips and passed out silverware while we peppered him with questions about where he goes to school and how he spells his name. Eventually, he cracked a slow smile and scampered to the back of the kitchen to unearth a bag of balloons. With big gulping breaths, he blew them up one by one, bouncing and laughing around the table. 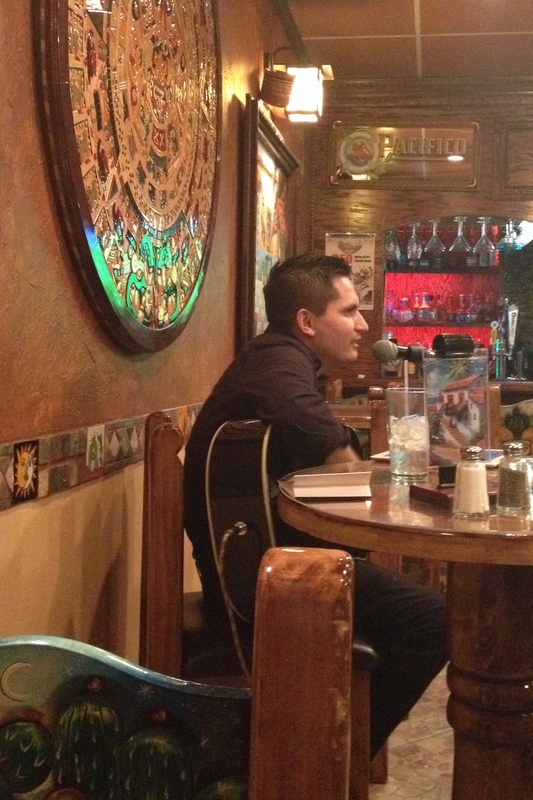 As we finished our meal—fajitas and enchiladas and crispy chimichangas—Carlos picked up a guitar and took a seat on a tall stool. “This afternoon,” he told us shyly, “I will sing for you.” And we relaxed back in our chairs while four-year old Henry and Jorge tossed a bright red balloon through the air, and listened to Mexican music. All at once, the afternoon had a magical feel to it, the feel of good food and music and familial traditions. 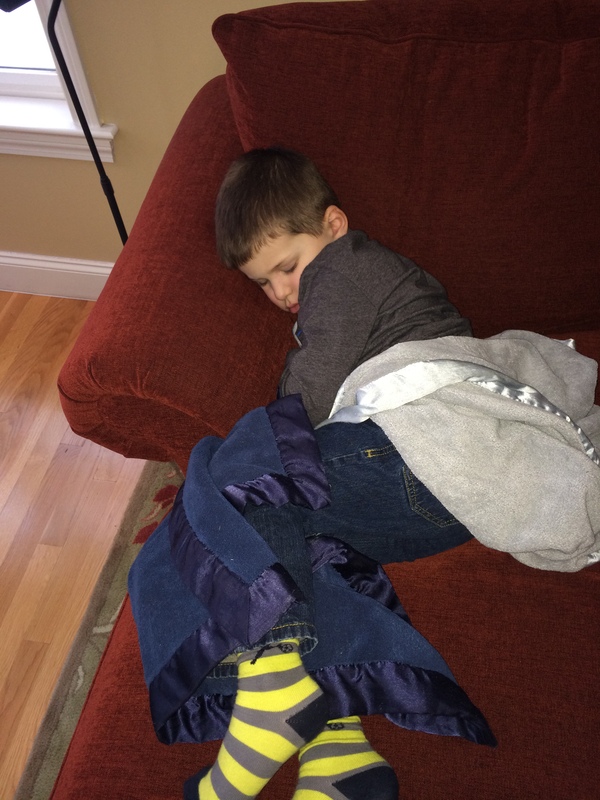 Once we got home, Henry fell asleep on the couch. His shirt had ridden up, and I poked his deliciously soft, warm tummy, chiding him, “Jorge is STILL WORKING! While you take a nap!” He opened one sleepy eye and rolled over, wrapping his blue blanket around his shoulders. Later in the evening we all settled down to watch football. Which is to say I put my pajamas on, curled up by the fire with my People Magazine, and demanded my children bring me the snacks. We didn’t make it to the end of the Seahawks game, so I never saw Erin Andrews interview Richard Sherman. But the next day cyberspace exploded with the controversy, and Monday afternoon I watched the clip to see what all the fuss was about. Obviously, I was taken aback by his fervor, his tone, his screaming. I turned the volume down on my laptop so Charlie—sitting in the next room—wouldn’t hear the verbal blast. But I was even more taken aback by the several articles I read over the next few days suggesting that America is not ready for someone like Richard Sherman—that a minority who catapulted to the top after a long and difficult climb from the bottom makes us uncomfortable. This is what I know about Richard Sherman: he plays defensive back for the Seahawks. He grew up on the streets of Compton, California and graduated from Stanford University. He has blossomed and thrived despite a shaky beginning and a childhood full of obstacles. He is the stuff of modern-day heroes. I am ready for Richard Sherman. But I am a little surprised that he did not learn certain qualities during his time at Stanford and his career with the NFL; sportsmanship and dignity and humility. Grace. Because it is these qualities that will endure long after his body can no longer run and tackle and throw. I don’t watch much in the way of news, but I have never turned on the television to see an oncologist screaming that he’s the best in the world because he just saved a child’s life by removing a tumor in her brain. The same goes for soldiers returning from Iraq, firefighters who put out horrible blazes, lifeguards who rescue drowning toddlers. But still, I am ready for Richard Sherman. Stories like his inspire me—they make me want to do better, to be better, to live better. I look at my nine-year old son Jack and consider the obstacles in his life—maybe not drugs and street gangs and violence, but lights that are too bright and fire drills that are too loud and I don’t want this autism in me anymore. So, ultimately I am happy for Richard Sherman. For now though, I think I’ll honor the unsung stories—the ones you have to hold your breath to hear and close your eyes to see. The ones unfolding around me every day. Oncologists and soldiers and grandmothers and firefighters and veterans and teachers. A brave little girl clutching her father’s hand through the dark hillside of Italy. A doctor with long dark hair gently murmuring to a very tired boy with autism, come on Jack one more line you can do it read one more line. A slender man in the corner of a half-empty restaurant quietly singing Mexican ballads, and a little boy taking a break from folding napkins with his beloved father to blow up a shiny red balloon.